As described in the previous article (which can be read here) I dedicated myself to refitting the chainplates during the past weeks and finished the work some days ago. By dismantling, cleaning and painting the chainplates with anti-corrosive varnish I prepared these important metal parts for their next service live. 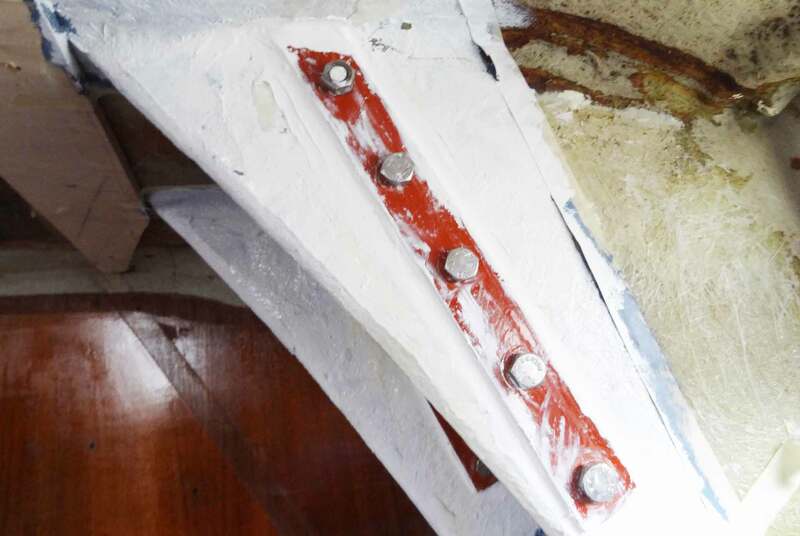 Today I am going to tell more about how I refurbished the old sandwich core and finally installed the chainplates thus ending this vital item on the big refit-program of my King´s Cruiser 33. 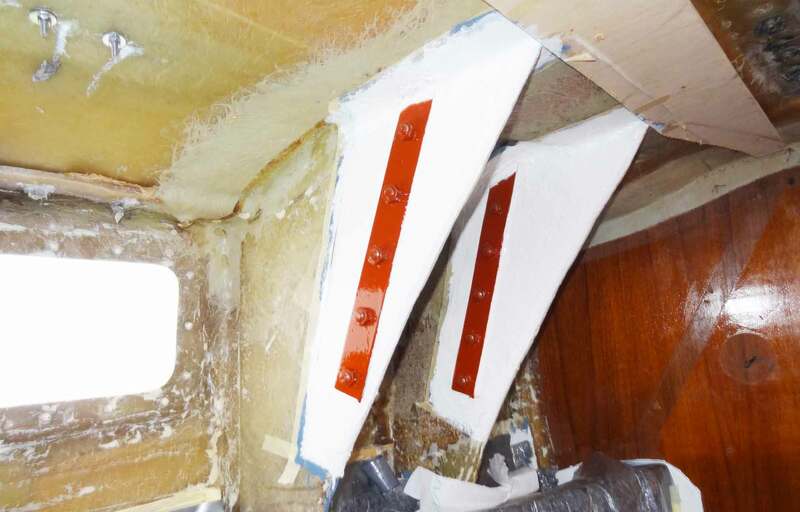 As I have assessed when dismounting the chainplates, constant seepage of water has destroyed the inner Balsa-core of the sandwich-construction some 5 to 10 centimeters around the chainplate-outlets through the cabin roof of the yacht. By the way: When buying a sailing yacht you should try to avoid Balsa-core sandwich constructions and opt for foam as this material is a lot more tougher against water than Balsa. 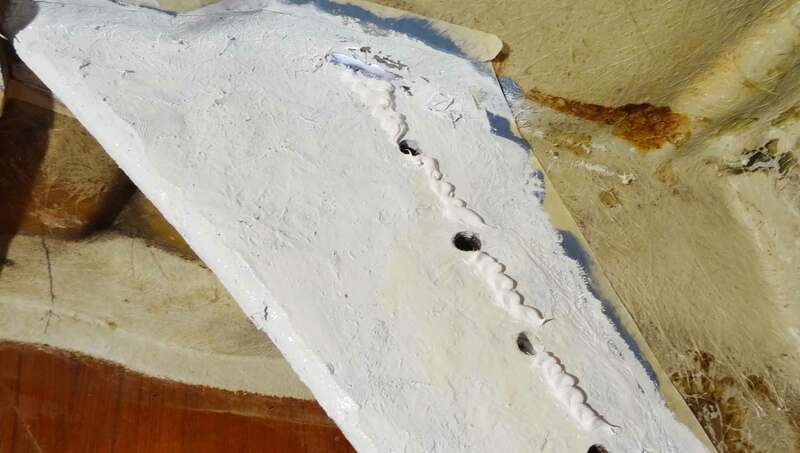 The option here was simply: Fill it up, rather than having to remove a larger portion of GRP from the deck, exchange Balsa for foam and laminate the GRP again to the structure. I was lucky for not having to go this rather elaborate way. There you go: Creating Expoxy-resin is a simple as ABC. The set comes with two components – each of which alone doesn´t work at all. It must be mixed with the right ratio. Bringing together resin and hardener is the first step. I was wearing a breathing mask as I was expecting hazardous fumes when preparing the liquid but was really surprised when I realized: Epoxy does not smell at all! As it is important to fabricate the whole solution with a most accurate the mix ratio I accepted the help of the industry by opting for having them stirred in special measuring jugs made of plastic which I found most practical. Most of the common mixing ratios are printed on these plastic buckets allowing to be both fast and precise in producing the desired mixture. 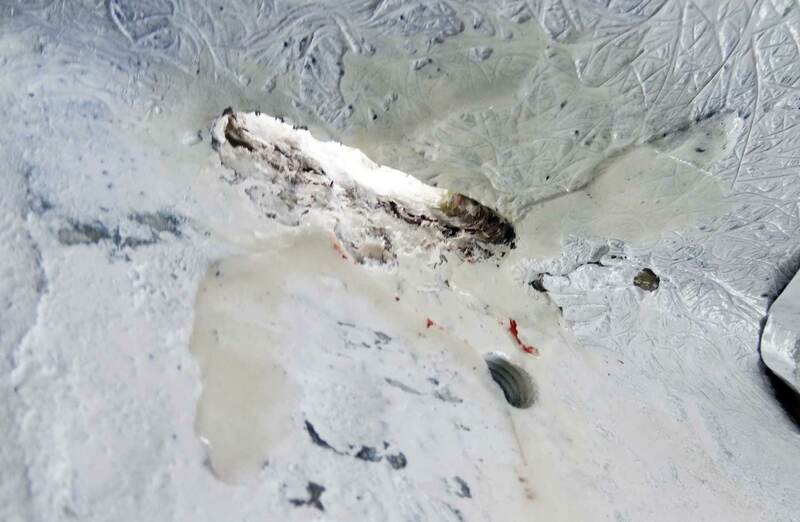 When Epoxy turns into a yellowish-whitely kind of viscous fluid it was just all right. Then I add Microballoons. Hey, what´s that? 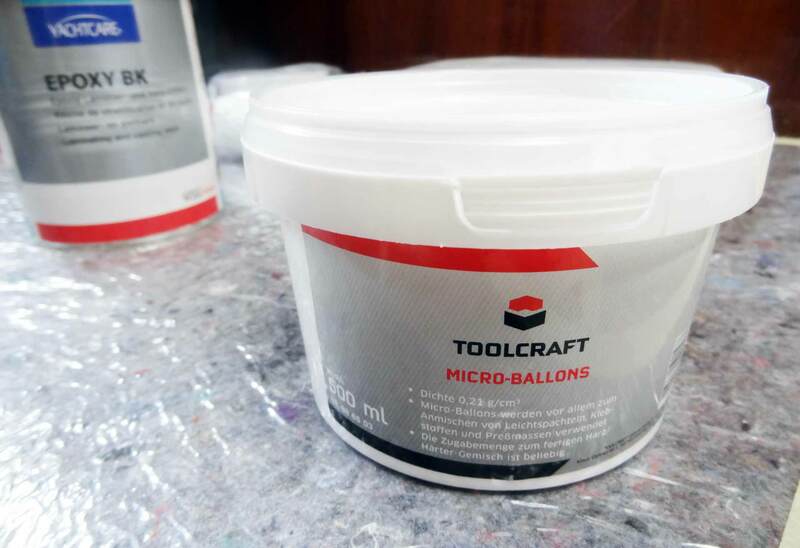 Microballoons is simply a synthetic filling agent which is available in different grain sizes. They are made of plastic or even glass. The ones I opted for have been very, very tiny. A white powder, I you want. 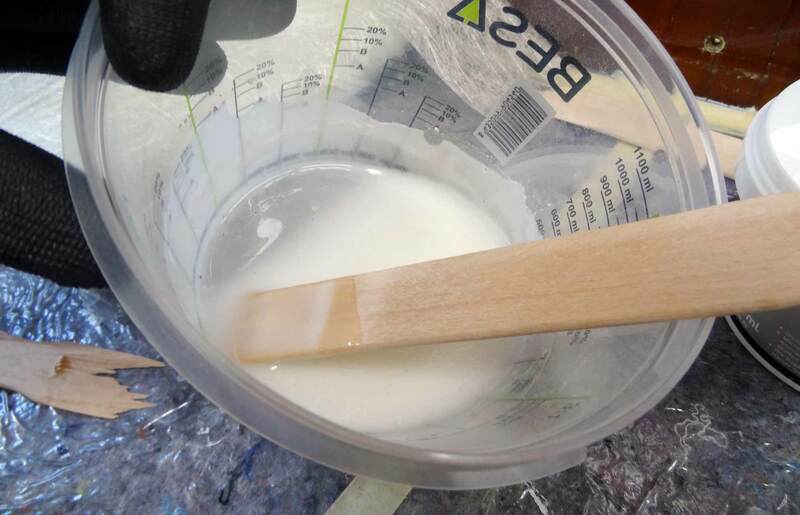 I pour in a good chunk of Microballoons into the Epoxy-solution until I achieve a more milky white fluid. Ready to be applied now. 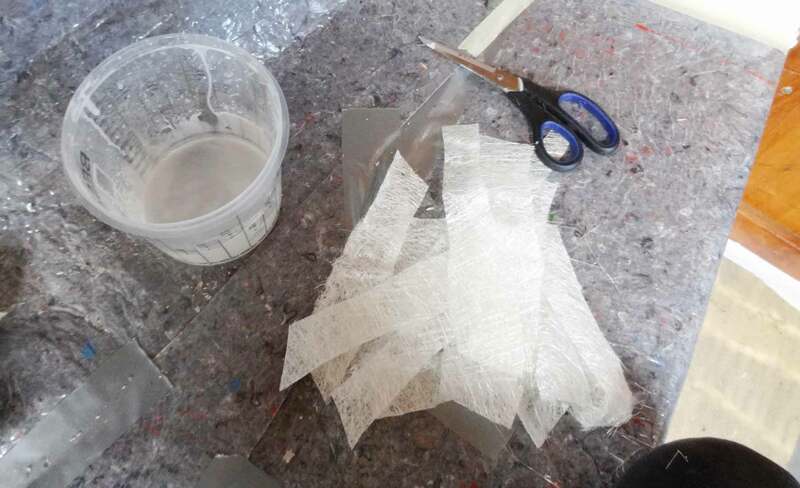 After adding hardener to the resin you´ll have some hours time for working with the solution until hardening process takes in. Now I search for ordinary kitchen scissors and unbox the freshly bought bale of glass-reinforced fiber – this GRP will be the Balsa-substitute. All around the chainplate outlets I already removed the rotten Balsa-core in a radius of up to 10 centimeters. As everything is dry and fine now, the party can begin. 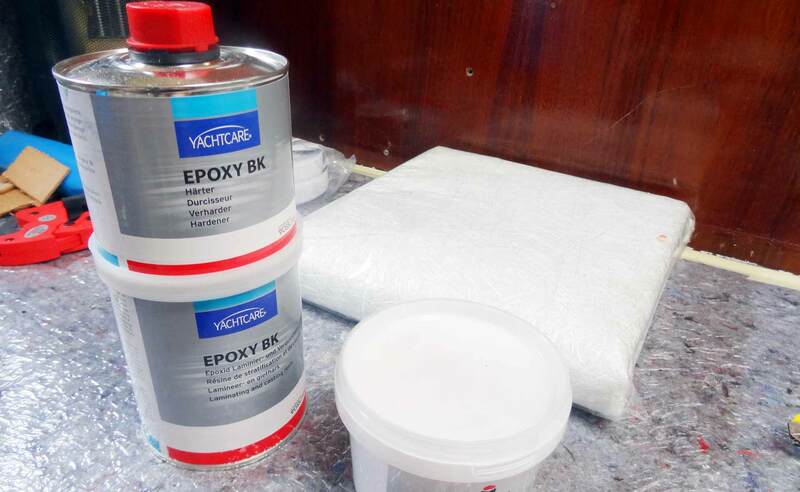 I soak the stripes of GRP with Expoxy-Ballon-solution and begin to have it stuffed through the outlets into the space between the GRP-hull of the deck construction of the cabin roof. It´s kind of a messy work as naturally the GRP-stripes are dripping from Expoxy and I have to work fast – though accurate. With the help of a discharged unfit watchmaker´s screwdriver I am able to complete this task surprisingly fast and neat. More and more material goes into the void spaces of my cabin roof. 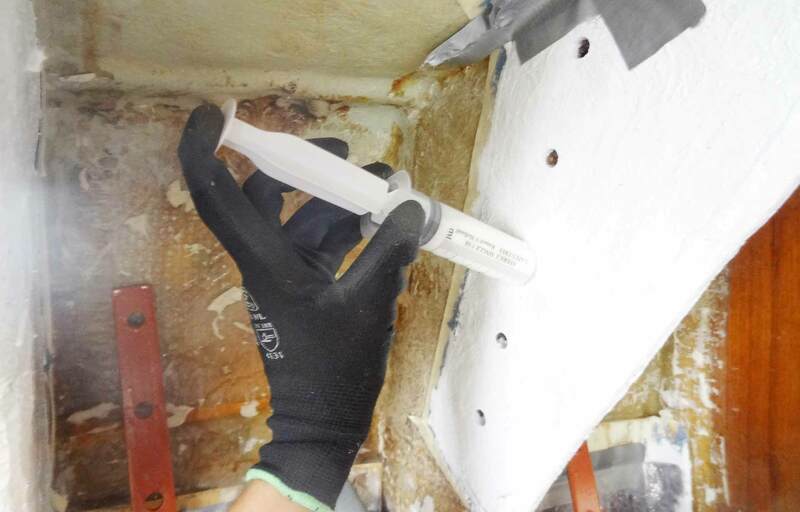 I am perfectly aware of the fact that a lot of Resin might be sipping through the cabin roof and pour down into the saloon – although I tried to hold back most of it by “sealing” the outlet with Gaffa tape. Of course, down in the saloon a large area is covered with paper towels to absorb Resin. 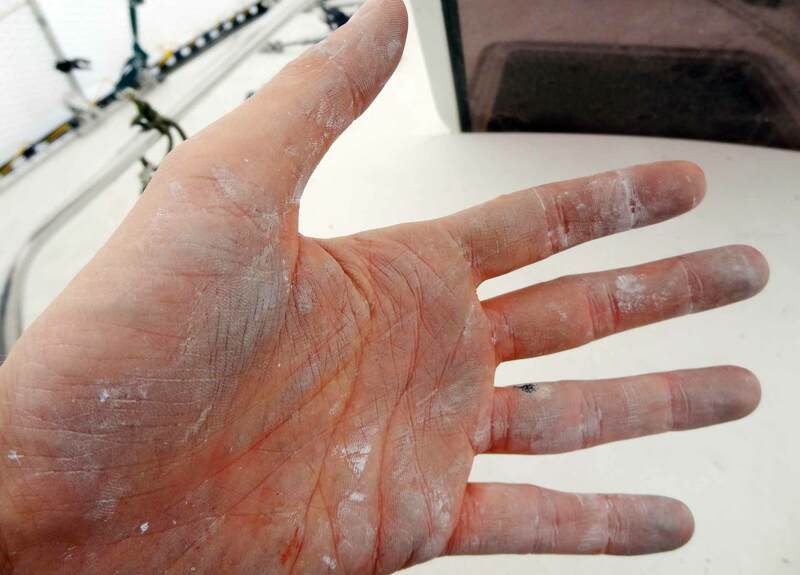 Drying time of Epoxy resin is normally more than one day so you won´t have to put yourself in a hassle to finish work. 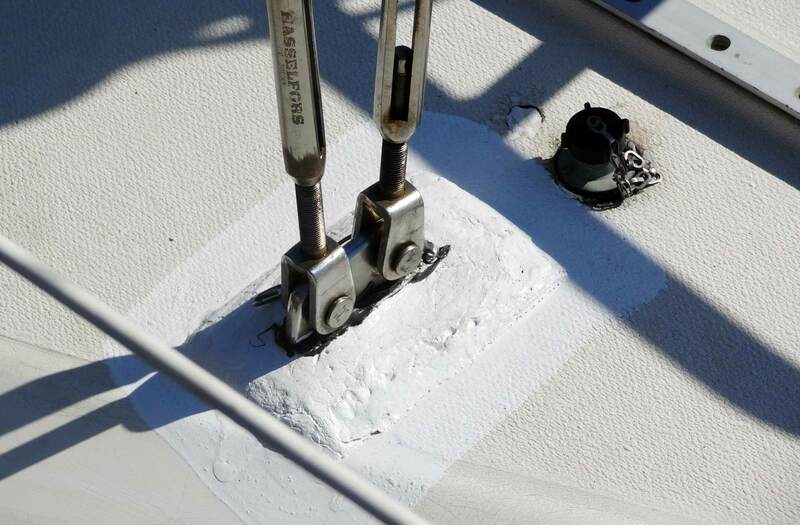 It takes some 20 minutes for each of the two outlets (as the other two chainplate outlets haven´t been affected by leaking water) to be filled up with Epoxy and GRP-stripes and I proceed down below deck. There I need a slightly different method to have the chainplate stringers refurbished. 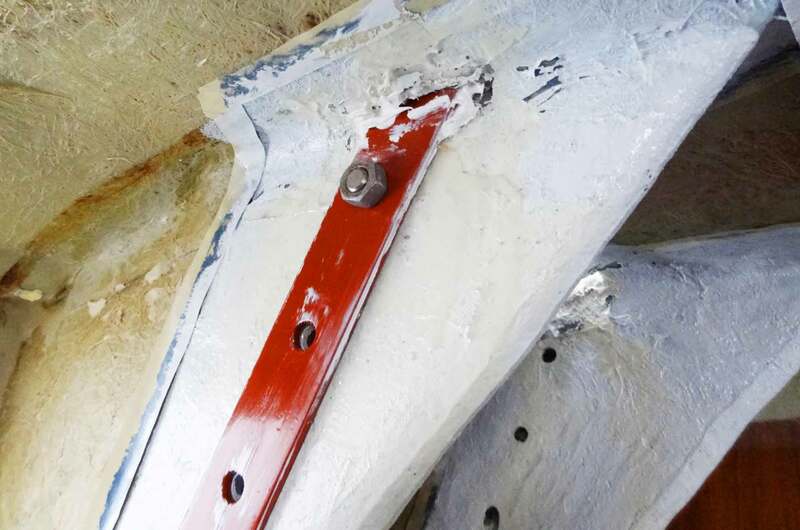 The chainplate stringers are crucial for the yacht´s structural integrity as these GRP-made elements to absorb the forces into the hull induced by the shrouds into the chainplates. As I discovered earlier, I did have some rotten Balsa-core material within the stringers due to leakage though fortunately not so much. Three of the 20 holes through which the chainplates are boltet to the hull have admitted seeping water drops causing the core to rot. For filling up these holes I utilize large disposable syringes appearing to be the most practical solution. I can fill up the voids very fast and in a clean manner with Epoxy and stuff the GRP stripes into them afterwards. Work done! After cleaning waste Epoxy around the outlets and spilled all over the settee in the cabin I can sit down and relax. It took some three hours net working time to refurbish two big and three small holes and have them filled up with Epoxy and GRP-stripes. Allowing the whole work to dry thoroughly for the next seven days I am amazed of the outcome when looking at my work a weekend later: Everything is as hard as expected and looks nice and clean. Next chapter. Now that everything is dried through I have to remove surplus material. 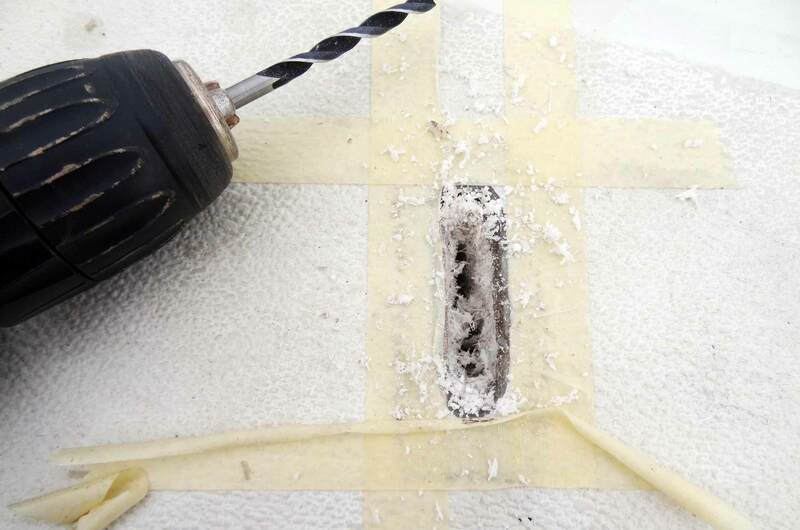 Utilizing sharp carpet knives isn´t working at all – Epoxy´s too hard here. I try my cordless screwdriver equipped with a size 6 wood drill and – wow – it´s working out really quite nicely. Upon finishing the drilling process I clean up with a vacuum from time to time and try to fit the chainplates controlling a nice and neat fitting to the stringers both above and below deck. Then it´s time for sealing the whole stuff: Sikaflex-Action! 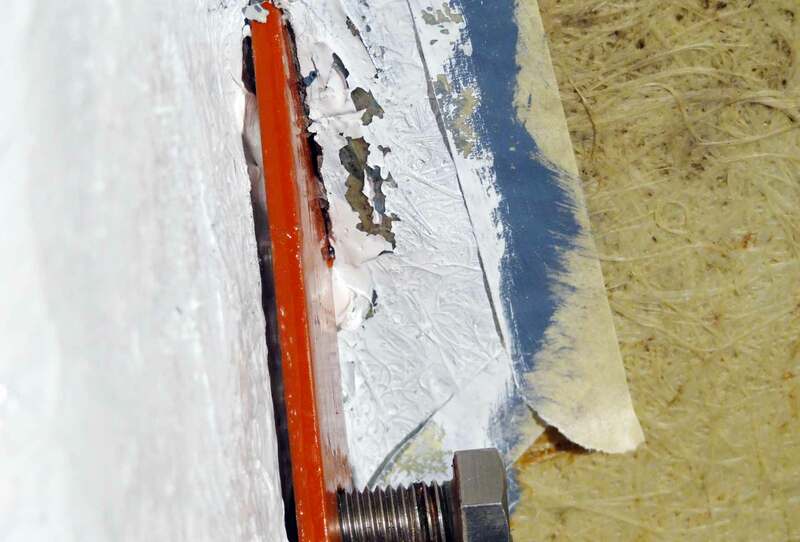 I am pressing this marine sealant into the outlets and level out the edges of the outlet, this trying to seal the newly applied Epoxy core from potential seaping. 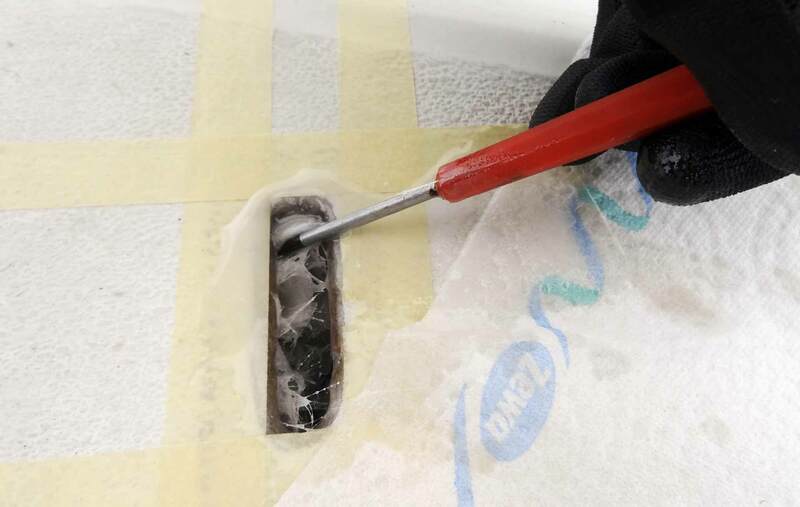 A second layer of sealant for the sandwich-core protection. Back on deck I begin working my way down. Taking the chainplates – shiny red painted with three layers of Owatrol Marine anti-corrosive protection-varnish – I inspect the upper end of the chainplate where the shroud-fitting is situated. This is where it is absolutely vital to have the chainplate completely sealed against seeping water. And here I decide not to act housewifely when working with the sealant. 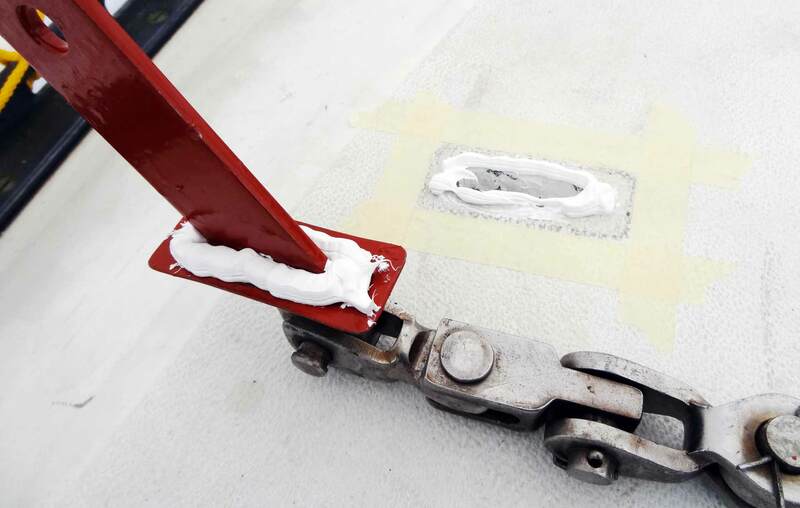 As well as on the ship´s surface as of the inner surface of the chainplate-cover (which I cleaned thoroughly with Acetone before) I do apply a thick worm of Sikaflex all around the outlet. Then I to insert the chainplate with much care into the outlet and down into the ship. But not pushing too neat. Having finished the work down below – which will be described in the next chapter – I will again return up here to remove excessive Sikaflex, take away the masking tape and clean the small seam between chainplate and deck structure to achieve a near-perfect outcome. But let´s proceed down below deck again: Most of the work happens here. Before I can start working with the wrenches I prepare the chainplate stringer below deck. When dismounting these parts I noticed that almost all of the chainplates had been apparently suffered from seeping drops of water between the chainplate and the GRP-stringer. And I want to prevent further seeping here, so I do apply Sikaflex amply to the stringer before I put in the chainplates from the outside through the outlets. After doing so, between chainplate and stringer a good supply of sealant should be apparent. Now I do press in Sikaflex directly into the seam on the chainplate outlet in the cabin roof. As much as I can. No stinginess here: We want to have this area sealed off from water for years to come! When done, I apply the first two bolts – one at each ends of the chainplate – and start to torque them tight. Torqueing the bolts and nuts should be done very (!) tight but not too tight. 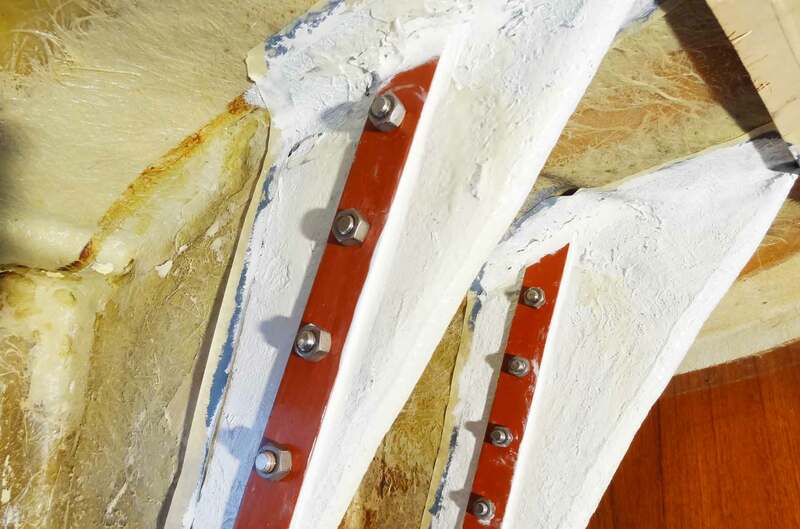 Let´s call it “hand-tight.” I don´t want to add too much pressure to the sandwich constructed stringers neither do I want to have the chainplates applied too loose and having allowance here, admitting the whole system to work loose over time, destroying the stringers in the end. Upon having inserted and torqued all the five bolts and nuts tghtly Iit´s cosmetics. I want to achieve a nice seam here too. Again, as with the outlet, I am not sparing Sikaflex because I want to have it sealed thoroughly. Later the whole construction will be covered by nice wooden panels again, but I want to have it done nicely anyway. You can work with Sikaflex sealant very nicely because it takes some time to dry. But you have to be very cautious too: It´s a messy stuff to play around with! Now of all times – it´s the last of the four chainplates where I completely mess up the whole process. After having applied Sikaflex and put in the chainplate I noticed that it was impossible to insert the bolts through the bore holes. 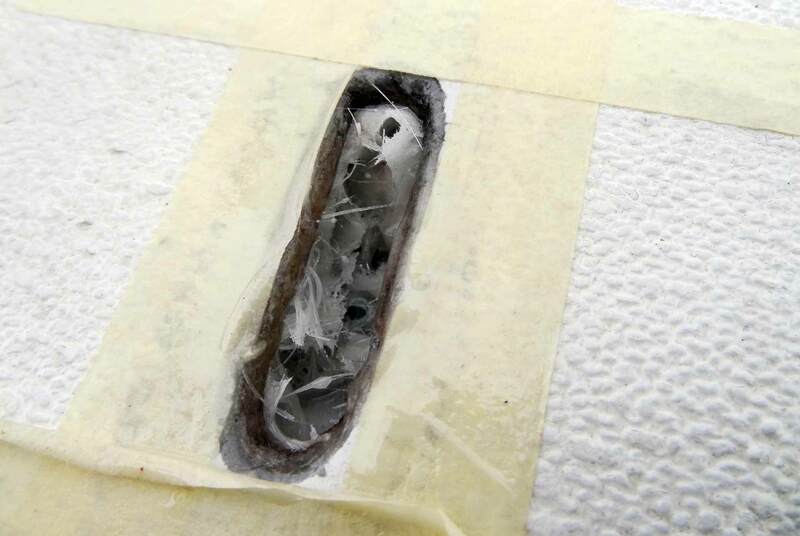 There was a small amount, a 2 millimeter ripple, of hardened Epoxy preventing the chainplate to fit properly. Oh my! I had to take out everything, grind away the Epoxy-nose and re-insert the whole stuff. Beware: Working with Sikaflex can turn into an absolute Mess! What a mess: Some two thirds of the Sikaflex did spill all over the chainplate and my hands, making it all look very bad. Naturally, I won´t have to remove all this stuff because it will be covered anyway but I am a bit frustrated. So, working with Sikaflex needs constant concentration. Anyway, in the end I am really excited and satisfied with my work so far. Looks neat. Thinking back to my RYA Coastal Skipper / SKS class some weeks ago (which can be read here) I remember another King´s Cruiser 33 berthing not far from our X-442 yacht. I went to have a look at the boat and noticed her huge chainplate-arrangement. Though that´s an early King´s Cruiser 33 version with just one single chainplate taking the strains of the two shrouds instead of my later version with two chainplates for each single shroud. 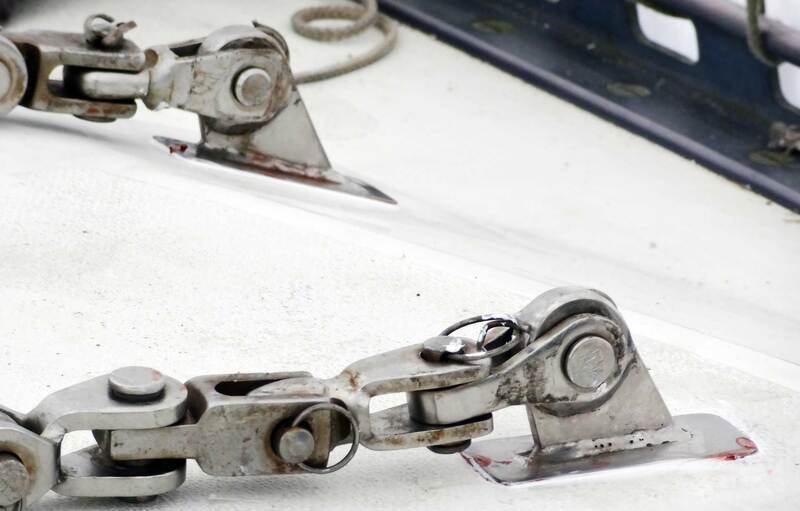 But what´s most striking: The kind of work done here to seal the chainplates … just … wow. My freshly installed Shrouds on deck. Seams are minimal but effective. And by pressing so much Sikaflex into the sandwich core-area, filling the seams of the outlet from both above and below I am perfectly convinced that I won´t need a “mountain of Sika” here. Later on when I will rig the ship again I will add aluminum-made bottle screw covers to have another line of water protection. As I was warning the dear reader before: Sikaflex on your hands is a pure mess! As much as I love this stuff, it´s a plague when spilled. I did wear gloves but when it came to torqueing and designen the seams nothing works better and has a better feel than bare skin on sensitive fingers. Above all, the mounting of the last of the four chainplates was a sheer catastrophe in this matter and so my hands were fully covered with a layer of Sikaflex. The Internet is full of all kinds of recipes how to remove Sikaflex, most of them advocating chemical products and the abrasion of the upper skin-layer. How to remove Sikaflex from one´s Hand. Well, I won´t do this terror to my skin. After just three (ugly hand-) daysmost of this stuff will disappear anyway and there´s a light bulb moment under the shower when I discovered that simply hot (!) water and a slight rubbing will take off most of the remaining stuff without any chemical agents. But in the first place: When working with Sikaflex, do it as clean as possible. 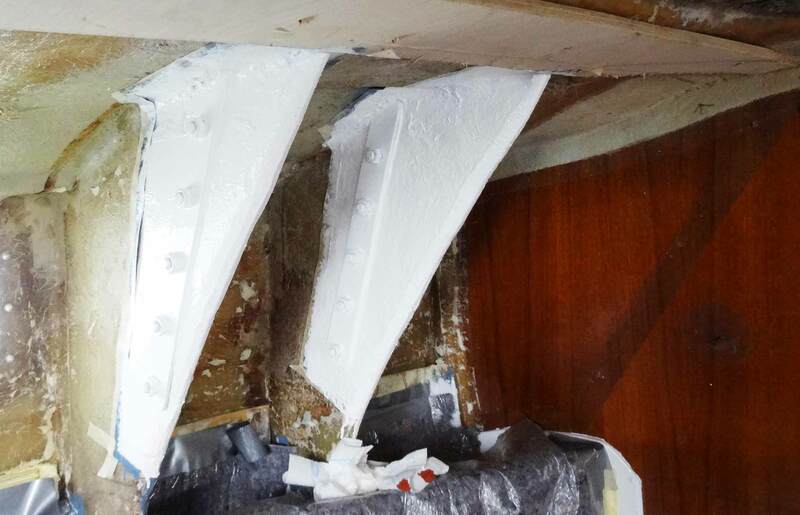 I do have some Danboline bilge paint left from refitting of the bilge done earlier (which can be read here, here and here) and I begin to paint the stringers as well as the chain plates with it. My aim is to achieve another layer of corrosive protection as well as to create a plain white surface on which I will be able to easily spot possible new leakage. Because, if I hadn´t done so, it would have been impossible to distinguish new leakage from the old markings. That´s it: Work is done! In the end, the whole process of refitting the chainplates was a work of 12 hours net. Material costs amount to a sum of 150 Euros. I am really proud again of the outcome and convinced of having achieved proper installation and sealing of my sailing yacht´s chainplates. After being able to cross off this item from my to do-list next up in my refit program is woodworks in general – of which I have already begun to redo and create some Teak-fittings for the head – and the complete refurbishment of the electric wiring and outfitting with LED-lights (LINK) of my ship during the coming weeks. Congratulations on getting the chainplates done! The look great. Stickaflex is a really messy thing to work with. Just the slightest spill and suddenly it’s everywhere. Keeping everything neat and clean when doing this kind of work is very tricky. I read a really great tip for working with epoxy or stuff like stickaflex on the web. Instead of using one set of latex gloves, put on 3 or 4 pairs, one of the top of the other. Then once the outside set gets dirty, you can easily peel them off and have a new clean glove inside, without having to stop work. I used this strategy while I was doing some very tricky expoxying inside my boat, and it worked great! thanks for commenting and – yes, indeed – your hint is really clever. will definitely try it out when i am going to have the crack in the engine footing repaired and laminated over in some weeks or months to come. Previous Post	Summer Skipper´s Essentials: Sailing Cap, Sailing Gloves & Sun Protection.